CDC Melbourne is a bus operator in Melbourne, Victoria, Australia. It is a Melbourne bus company that operates 55 bus routes under contract to Public Transport Victoria. It is a subsidiary of CDC Victoria, itself a subsidiary of ComfortDelGro Australia. and in turn a subsidiary of Singapore-based ComfortDelGro. The origins of CDC Melbourne can be traced to January 1976 when Kefford Corporation purchased Point Cook – Werribee Passenger Service, Werribee. 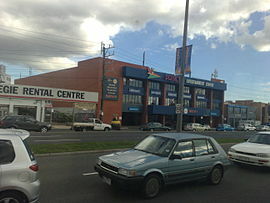 In July 1987 Bono Bus Lines, Footscray was purchased with route 406 Footscray – Keilor East and the operation rebranded as Westrans. Also in January 1988, Kefford Corporation purchased routes 605 Melbourne City Centre – Elsternwick and 630 Elwood – Monash University from Sinclair’s Bus Service with the operation rebranded as Eastrans. In May 1991, St Kilda Bus Service was purchased with route 606 Port Melbourne – St Kilda and rebranded Werribee Bus Lines. Later the Point Cook, Sitch and Weribee operations were also brought under the Westrans brand. In February 2009, ComfortDelGro Cabcharge acquired Kefford Corporation for A$149.2 million, including the Eastrans, Westrans, Davis (Ballarat) and Benders Busways (Geelong) brands. At the time of its acquisition by CDC in 2009, Kefford was the fourth-largest bus operator in Victoria with a 16% market share, and with a fleet of 328 buses and six depots. In July 2011, route 601 commenced as a high frequency shuttle between Huntingdale station and Monash University. In July 2013, CDC acquired the route operations of Driver Group with five routes (routes 612 and 623 – 626) and 42 buses, for $22 million. In 2014, CDC Victoria was restructured, with Davis Busways becoming a subsidiary called CDC Ballarat and Benders Busways becoming a subsidiary called CDC Geelong. In October 2014, Eastrans and Westrans were united and rebranded as CDC Melbourne. In May 2018, Tullamarine Bus Lines was acquired by ComfortDelGro Australia and its bus operations were integrated into CDC Melbourne. At the time of its acquisition of Kefford in 2009, CDC Victoria acquired a fleet of 328 buses. When the Driver Group was purchased in 2013, CDC Victoria also acquired 42 buses, bringing the Victorian fleet to 420 buses. As at March 2016, the CDC Melbourne fleet consisted of 277 buses and coaches. At April 2018, prior to the acquisition of Tullamarine Bus Lines, the fleet consisted of 281 buses and coaches. When Tullamarine Bus Lines was acquired in 2018, CDC Melbourne also acquired 36 buses, bringing the fleet to 317 buses and coaches. Westrans fleet livery was white with red stripes for buses at Altona and Sunshine depots, and white with blue stripes at Werribee depot. Eastrans fleet livery was white with white and green stripes. The Public Transport Victoria white and orange diamonds livery has been adopted as standard for route service buses and an orange, blue and white livery was adopted for charter buses. However some buses still retain the old Westrans livery with CDC Melbourne signage. ^ “Victorian Buses in the Eighties”. Australian Bus Panorama (6/8): 14. May 1991. ^ Melbourne Metropolitan Bus Operators and Fleet Listings. Melbourne: Bus & Coach Society of Victoria. 1991. pp. 31–34. ^ a b “Victorian Buses in the Eighties”. Australian Bus Panorama (7/1): 3. August 1991. ^ “Kefford Group Fleets”. Australian Bus Panorama (7/1): 35. August 1991. ^ “Kefford Group finds a buyer”. Australian Bus & Coach. 20 November 2008. ^ “ComfortDelGro Expands Melbourne Operations Through A $22.0 Million Acquisition” (PDF). ComfortDelGro. 20 May 2013. Archived from the original (PDF) on 5 November 2013. ^ a b Skelton, Andrew (20 May 2013). “Acquisition of further Bus Route Service Business in Melbourne” (PDF). ^ “Updates and News”. CDC Victoria. Archived from the original on 6 June 2014. ^ “CDC Vic pays deposit for north-west Melbourne bus operator”. Australasian Bus & Coach. 13 April 2018. Archived from the original on 9 May 2018. Retrieved 20 March 2019. ^ “CDC Victoria further strengthens bus footprint in Victoria” (PDF). CDC Victoria. 13 April 2018. Archived from the original (PDF) on 9 June 2018. Retrieved 8 August 2018. ^ “CDC Group”. Australian Bus Fleet Lists.